Chris Dennison with the HybridIII crash test dummy his research team uses to simulate the kinds of impact that can cause severe head injuries. The crash test dummy head is weighted and hauled with a pulley up the track. After a final check of the instruments and a quick countdown, the helmeted head plummets into an inevitable collision, moving at 4.5 metres per second. You and I can only guess what the impact would be with a concrete sidewalk or asphalt bike path. But the researchers in the University of Alberta's Department of Mechanical Engineering know. Mechanical engineering professor Chris Dennison focuses on the biomechanics of injury with emphasis on understanding how mechanical measures can be used to understand and predict injury risk, and ultimately prevent or mitigate it. Dennison and his students Brooklyn Knowles and Robert Butz are coming up with new experimental techniques using mechanical models of the head and neck (the HybridIII crash test dummy head-neck and corresponding numerical models of the brain) to simulate the kind of head impacts that can lead to significant head injury. Their goal is to understand how impact and other inputs to the head lead to injury. "The mechanics of head injury are complex, and the roots of our current understanding go back to the 1950s and 1960s when researchers and regulators first began to study head injury and develop methods to prevent it," explains Dennison. "The helmets we have today are effective at preventing the types of injuries that were of specific concern back then: severe life-threatening brain injury and skull fracture." But his team is also interested in more mild head injuries like concussions, determining which parts of the brain are affected on impact, and how the helmet interacts with the head to alter distress to the brain. "Recent research strongly suggests that the mechanics behind milder spectrum brain injuries (like concussion) are different from the mechanics that were used historically to understand risk of severe life-threatening brain injury and skull fracture. Today, there are models of brain tissue distress that appear to correlate well with brain injury, and this research suggests that angular head motions are the mechanism causing the tissue distress." "Our head form is equipped with nine accelerometers—three at the centre of the head and the remaining six at intervals inside the skull—to measure linear and rotational mechanics," says Dennison. The sensor measurements are input to a model that visually depicts the motion and deformations of the brain during a collision, so the researchers are able to see exactly which parts of the brain are affected most. "The potential audience for our research include the helmet standards organizations that are currently grappling with whether, and how, to include angular mechanics into the standards that all of our contemporary helmets are certified against," notes Dennison. So, in a nutshell, how helpful are helmets in preventing concussion? "The discourse suggests that helmets may need to change to better prevent concussion, but it is important to note that helmets have a long and very successful track record in saving the lives of people who would otherwise be dead due to a head impact," Dennison says. "If we want to change the way helmets are made, toward concussion prevention, we need to understand what mechanics lead to concussion and the human tolerance to these mechanics. This is a major focus of the current research in head injury." Martin Mrazik, a neuropsychologist in the Faculty of Education, is looking at concussion prevention from a different angle—and his new research suggests that psychological factors could be predictors of injury. "Now we are actually asking, are more anxious kids more prone to injury, and more prone to concussions? With psychological intervention, can we decrease the incidence of injury and concussion? And is there a vulnerable population that is just more likely to get injured?" Having identified that personality traits like psychological resilience are likely associated with decreased incidence of injury and better recovery times, Mrazik is focused on maximizing interventions that target these variables. "We will look at the kids who have the highest levels of psychological stressors like anxiety and mood disturbances, and we'll see if they are more likely to suffer injuries, and take longer to recover. If that is the case, what we know is that we can do something about it." "I see how much time and effort kids put into enhancing their physical skills, but I don't know how much they are actually looking at the mental game to reduce injuries and improve performance." Martin Mrazik is looking at whether psychological factors make some kids more prone to injuries like concussions. 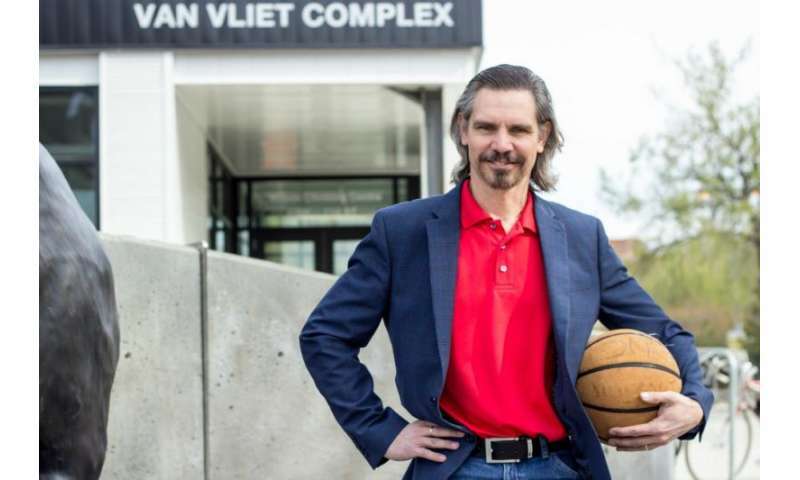 Mrazik and his colleagues, Connie Lebrun and principal investigator Carolyn Emery of the University of Calgary, are influencing policy-makers in government and sport. In a cross-Canada comparison between Alberta and Quebec done by Emery, the Albertan kids playing peewee hockey had three times as many severe injuries and three times as many concussions. Since then, Hockey Alberta implemented a no-checking rule in 2012. Now that the rules regarding checking in minor hockey have changed, the team is taking it a step further. "With 20 hockey teams recruited in the Edmonton area, coupled with many others from Alberta and British Columbia, we are now evaluating whether we've achieved the desired outcome by taking checking out," says Mrazik. Throughout the fall and winter, the researchers were able to collect data on injuries as they occurred. Parents would take children who were injured on the ice to the U of A's Glen Sather Sports Medicine Clinic, where Lebrun would see them. "Dr. Lebrun did the medical evaluations and collected all the medical data: were they unconscious? Did they have nausea? Vomiting? How long did it last? Did their symptoms improve?" says Mrazik, adding that Lebrun would then make the call whether the young athlete was cleared to return to play. As important as how concussions happen is when and where they happen—factors that are being examined by Dhiren Naidu from the Faculty of Medicine & Dentistry. Naidu, a specialist in physical medicine and rehabilitation with a diploma in sport medicine, is the head team physician for the Edmonton Eskimos, the Edmonton Oilers and the U of A's Golden Bears football team. "Players take their time on the field or ice very seriously," he says, "so finding ways to mitigate injury and concussions is vital." Naidu has been key in implementing a consistent concussion management program for the varsity teams and the Canadian Football League. "We are doing some research to find out when concussions are happening. Is it on hard surfaces? Is it in the fourth quarter when they're tired? We are looking at variables to get that macro-perspective." As a physician and as a parent, Naidu points out that having solid knowledge about sports injuries and concussions is important for all athletes—and their parents. "These are good things to know at the professional level, but the findings will certainly also have a positive impact on the 15-year-old who's playing football or the 13-year-old kid who is on the ice, and perhaps reduce injury." When it comes to concussion testing and management, Mrazik is the go-to psychologist. "I am very fortunate to work with a great team of clinicians who consult with the NHL, the CFL, the NASL and the U of A's varsity teams," he says. "When you are very connected with these elite athletes and can see what is going on there, and important lessons learned, then you can bring it back down to the grassroots level. We also want to bring this knowledge to varsity and minor hockey." When a player takes a heavy hit in the CFL or NFL, that player is immediately removed from the game and assessed by a team of experts. "I'm part of a team where my role is to do the neuropsychological testing," says Mrazik. "I look at the player's cognitive and psychological functioning and symptom report." But he doesn't make a diagnosis alone: "I talk to the primary physician and athletic trainer to make sure that we have clinical consensus for them to go back to play." Naidu adds, "It is true teamwork. To make a good decision for people, we each have our own area of expertise, but it is the team that makes it work. We all want the players to get back in the game, but we want them in the game healthy." At the U of A, all players complete a cognitive function test at the beginning of the year to establish a baseline. "We want to find out if there are any existing issues—migraines, learning disabilities, trouble falling asleep, nervousness—that need to be considered. Then, once they have a possible concussion, we want to see what changes occur," Mrazik explains. This way, the team physicians will have some solid data to support a decision to keep the star player on the bench. 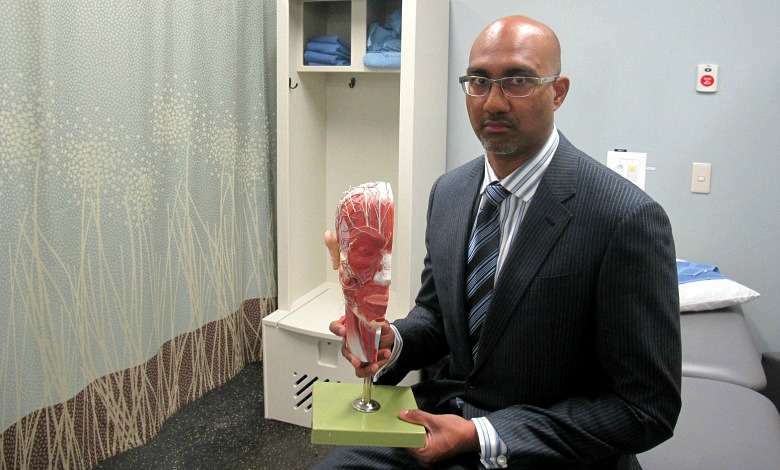 Dhiren Naidu is head team physician for the Edmonton Eskimos, the Edmonton Oilers and the U of A Golden Bears football team. The Sport Concussion Assessment Tool (SCAT3) is used to determine whether the player has a concussion. "The SCAT3 really is the gold standard," says Naidu. "But to do it properly, you have to have some knowledge, and even with that, it is tough for people without a lot of experience to interpret. The SCAT3 is great for professional teams, but not necessarily great for parents or coaches to assess kids on amateur teams." With that in mind, Naidu is embarking on research this summer to try to find a tool that may be more suitable for amateur athletes and coaches. "This year, in conjunction with professional and university-level football, we will work with the King-Devick test. It tests rapid eye movements and attention—how the visual system is connecting with the brain." Naidu notes that the test has been around a long time and is much quicker to administer. "The SCAT3 test takes 15 minutes, while King-Devick is only three to five minutes, and you need less medical experience to administer it. We want to find out if this is a better test for teams with less available medical expertise, and whether it correlates to findings on the SCAT3." Concussions can happen in an instant, but recovery can take much longer, and requires both mental and physical rest. Unfortunately, convincing a person who is normally very active to understand that and actually get the needed rest is no easy feat. In a Canadian Institutes of Health Research funded project with Michelle Keightley of Toronto's Holland Bloorview Kids Rehabilitation Hospital, Mrazik is developing new tools for helping people with a brain injury follow the standard protocol after a concussion. "Using Fitbit-like technology, we can track their movements and encourage them to take responsibility for self-care." Mrazik explains that education is half the battle. "People say 'get rest,' but what does that mean? The recommendations are cognitive rest, as well as physical rest. You shouldn't be exercising or using your iPad … well, try telling a 14-year-old that!" "We are looking at how we can improve performance, how we can keep people in the game." Mrazik adds that the U of A's research is helping redefine what healthy means in sport. "Great athletes are having neurobehavioural problems after years of falling down, sniffing smelling salts and getting back in the game. We know more now. We know better. The days of toughen up and walk it off are over. Our new mantra is, 'When in doubt, sit them out.'" A concussion is a common form of head and brain injury. It can be caused by a direct or indirect hit to the head or body (for example, a car crash, fall or sport injury). A concussion causes a change in brain function, which results in symptoms that vary as widely as the people suffering from them. Sufferers commonly experience headaches, neck pain, nausea or vomiting, sensitivity to light or noise, and dizziness. Symptoms often last only a few hours, but on rare occasions they can continue for weeks. With a concussion there is no visible injury to the structure of the brain, meaning that tests like MRI or CT scans usually appear normal. But as physicians, cognitive researchers, athletes and parents know, the effects of a concussion are real—and they can be long-lasting. MYTH: Concussions only happen when you are hit in the head. FACT: A hard hit to the body can also jar the brain. MYTH: The only way to know whether you have a concussion is with an MRI. FACT: Only severe concussions will be indicated on an MRI. A concussion is diagnosed using a specific physical and psychological protocol. MYTH: If you take a hit to the head and you don't pass out, you don't have a concussion. FACT: Most concussions will not result in a loss of consciousness, but can still be very serious. MYTH: You will recover from a concussion after a good night's sleep. FACT: It can take your brain several days, and up to several months, to recover from a concussion.